Got Stains and Odors? We’ve Got The Solution! What is “urine,” really? Is cat pee the same makeup as dog pee? What about human pee? By nature, all pee has similar components. Over 95% of urine is water, with the rest being a combo of urea, uric acid, sodium, potassium, creatinine, and a few other elements. However, all pee is not created equal! 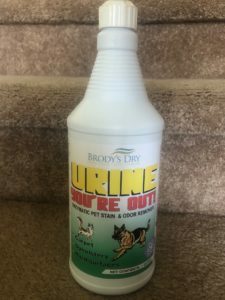 You couldn’t hand in a sample of your dog’s urine and pass it off as your own (although some people have apparently tried this!) because the difference lies in the types of hormones, metabolites, and bacteria that are specific to each animal. Also, cats and dogs don’t drink as much water as humans, so pet urine is much more concentrated and much more odorous than human urine. This concentration is a big deal when it comes to removing pet urine from your carpet! Urine You’re Out! is also great for stains involving blood, vomit, food, grass and any other organic mess. It’s great for families with active kids as well as those with pets! Just spray the area as directed on the label, leave it to dry and let the enzymes do the rest. Urine odors will be replaced with a clean, fresh scent once the carpet is dry. Got pets? Got kids? Got messes? You need Urine, You’re Out! 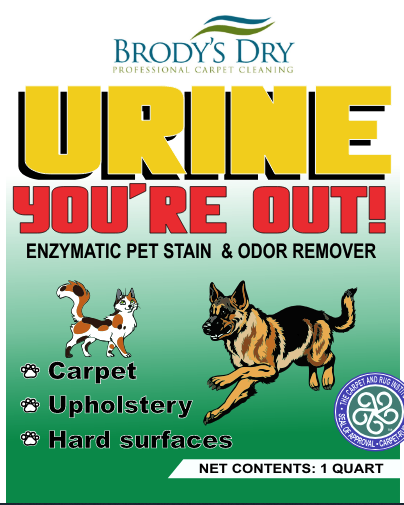 Call the Brody’s Dry professionals today to get your hands on a bottle or two! Give us a ring at (816) 895-7000 or just click HERE.